Place 5 foil balls into the bottom of a 6-quart slow cooker. Remove anything from the inside of the chicken (like the neck, etc.) and discard. Place the chicken on top of the foil balls. Brush the butter onto the chicken, sprinkle with the salt and pepper. Brush 1/2 cup of BBQ sauce on the chicken. Cover, and cook on LOW for 4.5 hours. Don't open the lid while this is cooking. 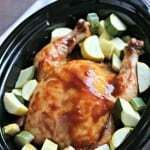 After the chicken has cooked for 4.5 hours, open the lid and add the sliced zucchini and squash and cook for 1.5 hours longer on HIGH (I do this part on HIGH because heat escapes when I open the lid to put in the veggies). Brush the chicken with the other 1/2 cup BBQ sauce and serve.